Cooking in someone else's kitchen: Too perfect? I arrived in Edinburgh this morning after a day of travelling and my hotel room wasn't ready, meaning I couldn't immediately rest and recover. 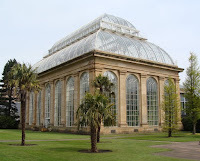 So I dropped my bag there, eschewed the shops of Princes Street and the tourist traps of the Royal Mile and instead walked up to the Royal Botanic Gardens at Inverleith. This is a lovely oasis of calm in the city, with hundreds of mature trees and a variety of specialised gardens. The garden has been on its current site for nearly 200 years and the Temperate Palm House, pictured here, was built in 1858. 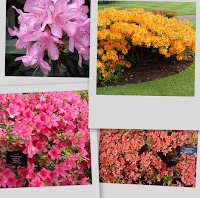 At this time of year the rhododendrons are looking particularly splendid, as were the rock gardens. The place was lively with school parties, mothers out with their toddlers and many other folk who, like me, were wielding their digital cameras. The visitor information states that "photography and sketching are allowed for private use; special permission is required for commercial photography". That seems a bit over-sensitive (or over-controlling) to me, although I wouldn't be likely to be selling any photos, myself! Jogging is also forbidden, which is another rule I'm never going to break, but which seemed a bit harsh. I wonder whether there is a squad of super-fit Royal Botanic Gardeners employed to run after any miscreant joggers to stop them from... well, what? Breathing too noisily? Damaging the paths by treading too heavily? Not having time to read the labels? All the labels and carefully maintained and delineated plants got to me after a while. It's all a bit too formal and structured for my taste (and contemplating the huge amount of work involved in maintaining this perfection was plain scary), although I do appreciate that the whole point of the place is to study and maintain the diverse plants. At the point where I was beginning to feel uncomfortable about the precisely-arranged nature of the site, I found the Scottish Heath Garden, which is a recreation of a Highland landscape. This was much better - more rugged, untidy and much more natural. 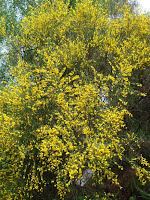 The broom was flowering and looking beautiful. I also prefer things to be a bit untidy and wild. My husband was just over there a couple weeks ago but didn't see any gardens. He did have a tour of a castle though. Me too (about preferring things a bit untidy.) I don't feel I have a lot of choice in my own garden! But this is one reason I've always liked English cottage gardens and disliked French formal gardens. It must be interesting to be back in GB! How long since you've been there? I was back briefly in April - in the south of England, though, so it's interesting to be further north, where spring is about as advanced as it is in Canada. When I was down south on my April trip it snowed quite heavily, which made me feel right at home! Ah! But this is Edinburgh! Tidiness, repression of emotion, keeping up public appearance - all very familiar. Maybe things have changed in ordinary life? Dunno! Lots else has. But traditional 'Edinburgh' seems to be being kept alive in the Gardens. Esther's description of Edinburgh is very familiar (I used to live there too). If you want wild Scottish gardens, try those on the West Coast, such as Arduaine, near Oban. The name means point, or promontory, and it has the most fabulous look-out point, with views over the Western Isles.